December Non-Farm Payrolls ahead of Fed: Do you think they actually matter? December Payrolls ahead of Fed: Do you think they actually matter? US economy expected to have added 200,000 new jobs in November. Wages seen improving, but still subdued. The US economy has suffered ups and downs this year, political jitters have been at the top of worldwide concerns and inflation remained "mysteriously" low all through the year, even for the Fed's head Janet Yellen. Yet pretty much nobody doubts the central bank will pull the trigger this month, providing the third rate hike for the year. A rate hike that FX traders have fully priced in long ago. With that in mind, do you think that Payrolls will actually matter? Let me tell you something, they will, only in the case we have a shockingly negative surprise, like the one we had in September. But the some 30K slump in jobs that month was a consequence of the hurricanes that affected the country and nothing like that is foreseen this month. In fact, data ahead of the event has been quite encouraging, with weekly unemployment claims down in the three last weeks of the month. Weekly unemployment claims have remained below 300,000 for 144th straight weeks, the longest since 1970. Additionally, the private sector added 190,000 new jobs in November, according to the ADP survey. The unemployment rate stands at 4.1% and is expected to remain unchanged at that level, as the economy is close to full employment. 200,000 new jobs are expected to have been added during November, after the 261K from October. The key, as usual, will be wages: average hourly earnings are forecast to rise 0.3% in the month, while compared to a year earlier, growth in hourly earnings is expected to accelerate to 2.7% in November from 2.4% the previous month. That won't be a shockingly positive reading, but surely an improvement from October's numbers. If the numbers surprise to the upside, they would surely back current Dollar's strength, but no fireworks should be expected, precisely because of the Fed and the ECB´s policy meetings next week. 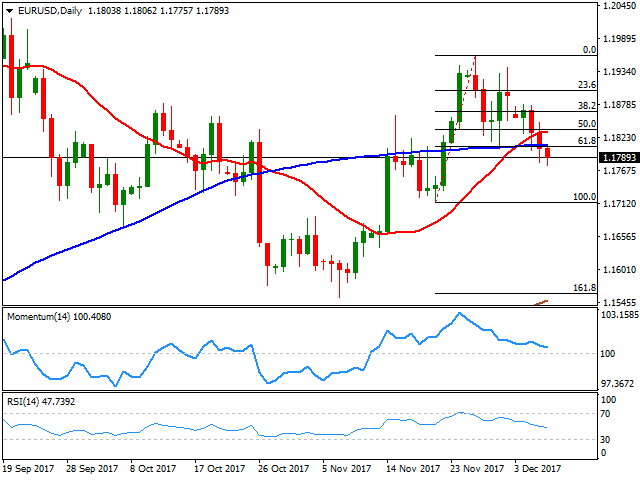 The EUR/USD pair is trading steadily a few pips below the 1.1800 threshold, which is the 61.8% retracement of the latest bullish run between 1.1712 and 1.1960. In the daily chart, the 100 DMA stands pat around the same level, reinforcing it, while the 20 SMA converges with the 50% retracement of the mentioned rally at 1.1830, also a strong static resistance level. It would take a clear advance beyond this last to put the pair back on the bullish track, with scope then to advance up to 1.1870/80, this week intraday highs. The immediate support, on the other hand, comes at 1.1715, ahead of the mentioned 1.1712. If somehow the pair manages to break below this last, the next probable bearish target comes at 1.1660.